Culverley Road and surrounding streets were laid out as part of an Edwardian suburban development by the Forster family on their Sangley Farm Estate, which was built piecemeal between 1902-1920s. Prior to this the area was rural, with a few fine villas along Bromley Road, the main route from London to Kent. Housing development had accelerated here as both rail and horse tram networks improved in the late C19th. With its grid layout of wide tree-lined streets and spacious houses with substantial back gardens the suburb preserved a semi-rural character. Culverley Green was a provided as a triangular area of public open space and has grass, trees and shrubs. Has taken part in Open Garden Squares Weekend 18 times, most recently in 2018. Developers began building housing for a new working and lower-middle class population, often on the former grounds of grand houses whose owners moved out as the area changed. Canadian Avenue (formerly Berlin Road) was laid out by 1894 and a series of large houses built along it by local landowners, the Forster family. Among the builders was James Watt who was also one of those employed by the Forsters to develop their Sangley Farm Estate to the east of Bromley Road. This was developed piecemeal between 1902-1920s and the grid layout of wide tree-lined streets, spacious houses with front gardens and substantial back gardens preserved a semi-rural character and attracted the middle-classes. Culverley Road was developed by c.1914 and included a triangular area of green open space that has long been maintained as public open space by Lewisham Borough Council. 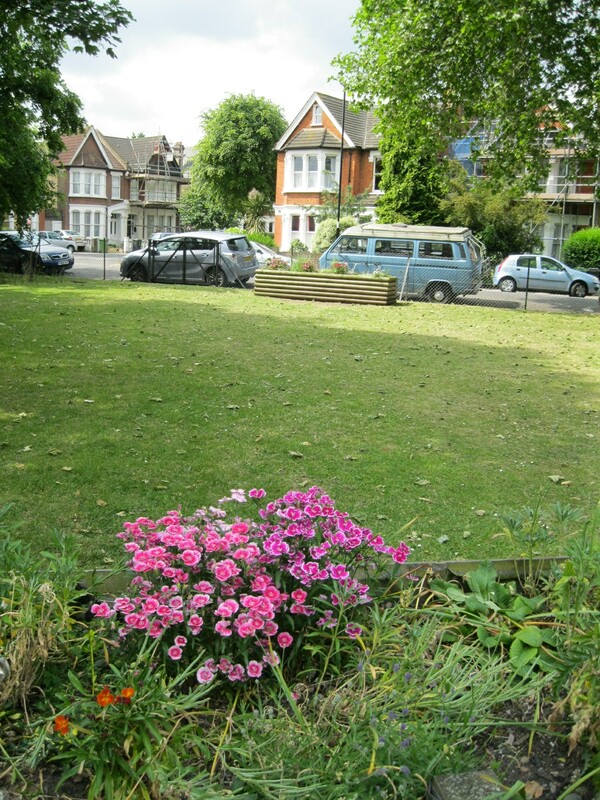 In recent years the active Residents' Association has been working to improve the planting and hopes to replace the chain link fencing that surrounds the site with new boundary railings. The garden has grass, shrubberies and trees, and a new initiative has been the planting of spring and summer bulbs. Other green space in the area that predates the Edwardian suburb is the Private Banks Cricket Ground that opened in 1874 and also Catford Cricket and Lawn Tennis Club, the pavilion and part of the grounds of which survive.